Lisbon Hills Electric Bike Tour in English departs daily at 10.00 and 15.00. This tour is available all year. Best in winter to avoid crowds, or in summer to enjoy the hot weather. We are comparing Lisbon Hills Tour by Electric Bike Prices from leading ticket suppliers and Try to find you Cheap tickets prices on the market. This is a fun-filled cycling tour for all levels of fitness, instead of puffing, panting and peddling up the steepest of Lisbon's 7 Hills you can simply turn on the bikes battery-powered motor and whizz to the top. Of course, if you prefer then you are welcome to use your own peddle power, the electric bike's motor can be turned on and off with a switch on the handlebars, so it's completely up to you. During the 2.5 hours you'll get the chance to visit some of the hidden gems and lesser-known sights of the Portuguese capital. Cycle through Fado houses and gothic architecture in the Alfama district, Lisbon's oldest neighbourhood, and get to know the Bairro Alto, Chiado, Mouraria, or Graca districts. Each tour is a little different from the last to keep things fresh. Throughout the tour you will be accompanied by an excellent bilingual guide who will take you through the most colourful and the darkest parts of the city using their local knowledge. Stop outside the Lisbon Cathedral, climb Lisbon's tallest hill to the Sao Vicente Monastery, zip through Eduardo VII Park, and gaze down to panoramic city views from the National Pantheon. Your guide will fill you in on the myths and legends of Lisbon and teach you facts and fiction behind this vibrant Portuguese city. If you're over the age of 12 and feel comfortable riding a bike then this tour is an excellent option, especially for visitors who would like to see an alternative side of Lisbon. Also great for those who would like to see a lot of the city, with the electric bike tour you can visit more of the city than standard walking tours. This is suitable for people of all fitness levels and suitable for individuals or small groups. 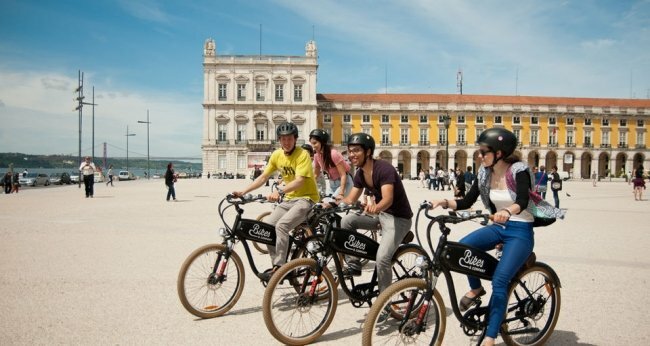 Your Experience With Lisbon Hills Tour by Electric Bike? Move away from Lisbon's busiest squares and start exploring the some of the lesser known streets. Glide effortlessly over some of Lisbon's 7 hills on your very own electric bike. Hear about the city, it's history and culture, from an expert local guide. Choose the departure time of your tour and join a 2.5-hour tour in your preferred language. Visit Alfama, Lisbon's oldest and most famous district. What Lisbon Hills Tour by Electric Bike Includes? Use of electric bike (for one person) and helmet. Tours that are not in English appear to run less frequently, particularly during the winter season when there are fewer tourists, so it is best to check which tour dates are available in advance and, if possible, reserve for at least 2 people to avoid cancellations. Travelers Reviews about Lisbon Hills Tour by Electric Bike? Lisbon Hills Tour by Electric Bike has received many 5 star reviews on trip advisor, this is one of the best ways to see the city. Comments focus on helpfulness and friendliness of tour guides and that the electric bikes make climbing the steep hills almost effortless. Some reviews mention that this tour is best suited for people who feel comfortable riding a bike as parts of the route will be on busy city streets. Tickets will be received via e-mail, please bring your printed or electronic ticket to show to your guide. Cancellation fees may apply if your cancellation is made less than 7 days in advance, depending on your ticket provider. Get Your Guide will issue full refunds up to 24 hours in advance. Age and height restrictions apply, passengers must be at least 12 years old and at least 150 cm tall. Please check the weather and wear appropriate clothing, we recommend wearing comfy clothing and flat shoes. The Lisbon Electric Bike tour is available in English, Portuguese, Spanish, French, or German and may be conducted in more than one language. Minimum groups size applies. If there are not at least 2 participants the tour will be cancelled and a full refund will be issued. Meeting Point: Rua dos Douradores, 16, Central Lisbon. The voucher is valid one day, while the guided tour typically lasts around two hours.